Palace Grounds is a unique edifice inspired by the Windsor Castle and built in the Tudor style. The Palace Grounds are famous for another reason - it is on the itinerary of almost all major pop/rock acts visiting the subcontinent. The last year has seen Deep Purple, Bryan Adams, Scorpions have given thrilling concerts in the city. The Palace Grounds also play host to international events like Bangalore IT.COM and Bio.Com. 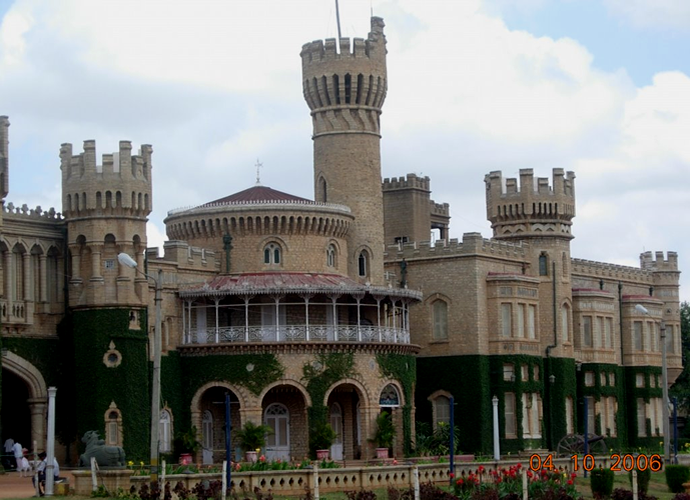 Bangalore Palace, a palace located in the city of Bangalore, India, was built to look like a smaller replica of the Windsor Castle in England. It was built by Rev. Garrett, who was the first Principal of the Central High School in Bangalore, now known as Central College. The construction of the palace was started in 1862 and completed in 1944. In 1884, it was bought by the Maharaja of Mysore, Chamaraja Wodeyar. Now owned by the current scion of the Mysore royal family, Srikanta Datta Narsimharaja Wadiyar, the palace has recently undergone a renovation.